Most guys think this is a romantic move but nearly half of all women hate it; what is it? Most guys think it’s a romantic move but nearly half of all women admit that they hate it when a man blows in her ear. 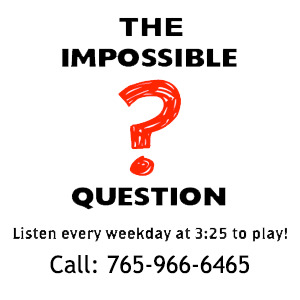 Congratulations to Elizabeth Gabbard of Connersville, IN for being the first to correctly answer the Impossible Question!